Billings Boats BIL605 St-Roch RCMP vessel 1/72 scale wood ship kit! The St. Roch was built at the Burrard Dry Dock in North Vancouver in 1928, intended for sailing in Arctic waters. It was the first ship to sail through the North-West Passage from the Pacific to the Atlantic. 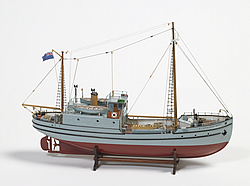 In the summer of 1944 the St. Roch sailed from Halifax to Vancouver, thereby becoming the first ship to complete the journey in both directions.